Firefighters belong to a very special fraternity, and it is one that can be honored with unique and customized fire department challenge coins. There is a lot of pride that goes into serving the community as a fire fighter — and rightfully so. These modern day heroes put their lives on the line every day to protect members of the community. Custom fire department coins are a great and tangible way that firefighters can show pride in their department and their fellow brothers and sisters. Some people consider challenge coins to be an old school practice. At Noble Medals, we like to consider them timeless. After all, our coins stand the test of time. Fire department challenge coins are often passed down through the family line, becoming one of those things you just can’t put a price on. Challenge Coins are also great for community awareness events and fundraisers! Whatever the occasion may be, generic trophies and plaques might be nice, but they don’t provide a very personal touch. 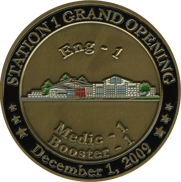 With our custom fire department coins, these commemorative medals and coins can include everything from specific graphics and custom edging to the inscription of a motto or fire department name. Our coins have been used to honor a long list of heroic firefighters, and nothing makes us more happy knowing that our hard work has been put to good use. If you are interested in designing and ordering fire department challenge coins, simply contact our team and we will collect some information and furnish an accurate quote for you. This whole process is free of cost and without obligation.